Rich has lived in Holmes County for several years now. If you know Rich’s warm demeanor you will know how he could be right at home in a place like Holmes County. 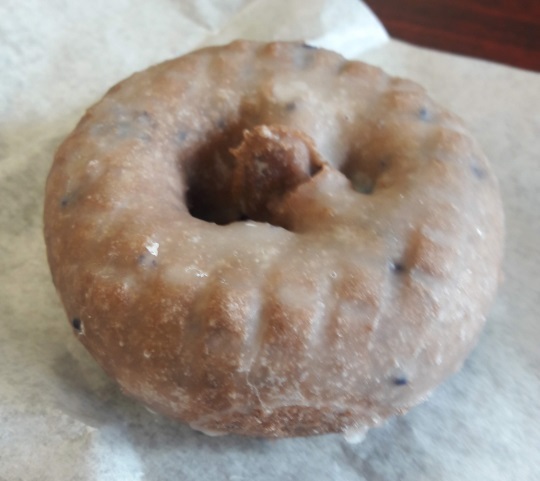 While out and about visiting some Amish friends and businesses one morning, we decided we were hungry. 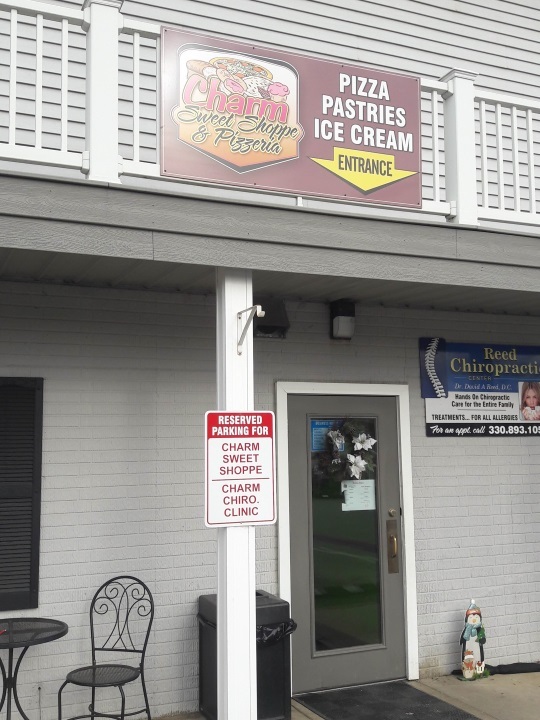 So we stopped in at Charm Sweet Shoppe & Pizzeria, a little business in, you guessed it, Charm. 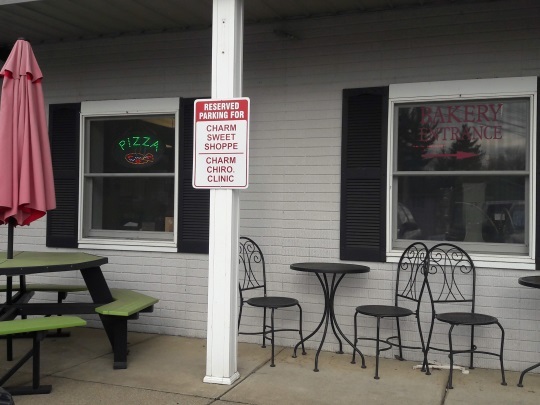 If you’re familiar with Holmes County, you’ll know Charm as an area heavily populated by Amish. We didn’t see a ton of people come in while there, but I think everyone who did come in was Amish. One of the other tables happened to be occupied by four Amish women happily talking over lunch. Somehow Rich figured out that it was a sisters’ lunch. You can see them queued up to order behind my pizza. Here’s a bird’s-eye shot of my pizza. We really liked the pizza. I think this was “Supreme”; Rich tried something else. It was kind of early for pizza, but I believe pizza can be consumed at any hour of the day. Of course I picked up some coffee and also some sweets. 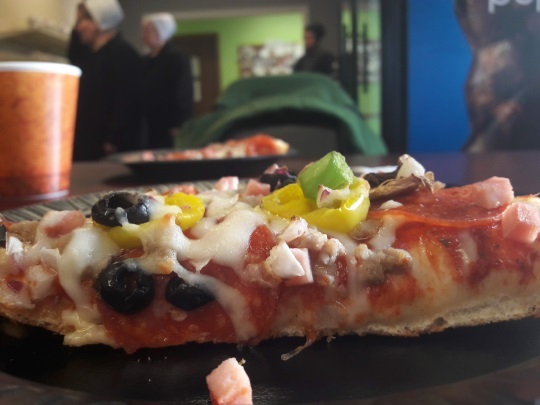 You can’t go into a “Sweet Shoppe & Pizzeria” and stick with only pizza, as good as it might be. The help there is very friendly. Running the register that day was an Amish girl, and we also spoke briefly with a youngish guy who appeared to be the owner or maybe manager. He wasn’t dressed Amish, but we heard him speaking Pennsylvania Dutch. And here’s the outside seating. Easy to find an empty spot out here in December. 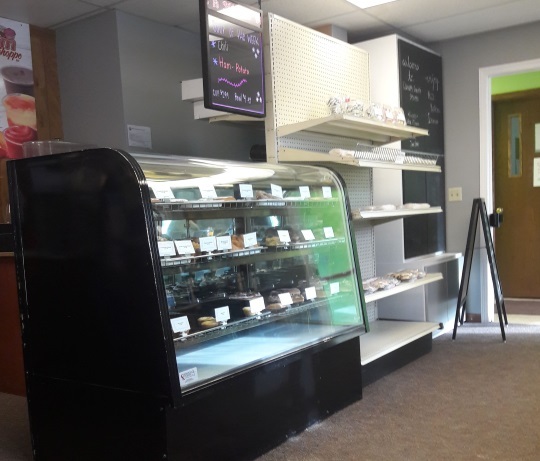 If you’re in Charm, stop in at the Sweet Shoppe for some tasty lunch and baked goods and a friendly atmosphere. This business is right in the middle of “downtown” Charm. You can see Hiland Bikes next door. Wouldn’t you just know it: because all the Amish women are such good cooks that our Rosetta is an excellent pizza chef. Her pizzas are unequaled in all of Green Lake County Wisconsin. Claudia and I have been to her house many, many times for pizza dinners. She makes a “cheeseburger” pizza that’s to die for. As for sweets; there’s nothing she makes that she gives us that lasts very long when brought home. We can’t praise her cooking enough. Maybe I’ll mention to her to make a move to Holmes County and open her own restaurant and sweet shop. That would take her too far away from where we live, so for now I’ll just be stingy and keep on enjoying all her wonderful meals when invited to eat with…our Amish family. Hmm I wonder how an Amish-run food establishment would do in Green Lake County area? Or is there something like that already? What cruel fate! My endocrinologist, earlier this week, gave me orders to cut back on these favorites of mine: pizza and sweets! And then you come along, Erik, with this mouth-watering, tempting post WITH PHOTOS to boot! If I ever make it to Charm, I’ll have to pack extra will-power! 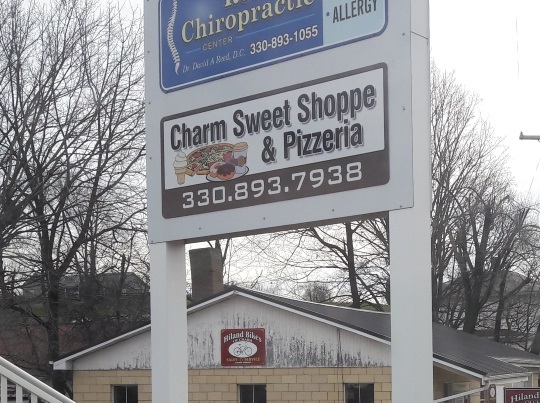 How did these folks come up with pizza and sweets as their business? I can’t say I ever saw a similarly-named/themed business anywhere. But with people like me as customers, I’m sure they’re doing well! How much weight did you gain, Erik, on your recent visit? Guess I’ll have to live vicariously through you! Actually if you check the site I listed at the bottom of the post, there is a back story as to how it got started. Sounds like they gradually added things over the years (it opened in 2012). 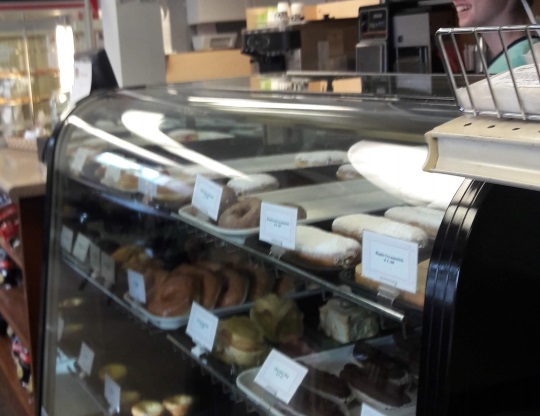 The founder used to work in the construction industry and is married to the daughter of the owners of Miller’s Family Bake Shoppe. If you’re in Charm, I recommend a visit to Keim Lumber. It’s one of the biggest “home center” stores I’ve been in anywhere, and out in the middle of what some might call “nowhere.” It’s on a 50-acre compound that includes mills and shops. Been there three times over the years and often wear a Keim Lumber cap in Maryland. I’m a hobbyist woodworker and am tempted to move to Charm just to have access to their 80 species of wood, including many exotic species. Keim has huge selections of everything from lumber to plumbing fixtures (280 designs of faucets, for example). I don’t know if the owners are Amish (founded in 1911 by Moses J. Keim), but there certainly are quite a few Amish employees. There’s even an eatery on an upstairs mezzanine. Every one I’ve approached was friendly and happy to take questions, even about local Amish customs. Excellent web site at keimlumber.com. I totally agree with the gentleman who pointed out Keim Lumber Company. Plan at least a 3-4 hour visit if it’s your first visit. They also have electric scooters for those folks cannot do much walking. This place is delightful. In addition to the food on the 2nd floor they also have live music at times which is enjoyable. 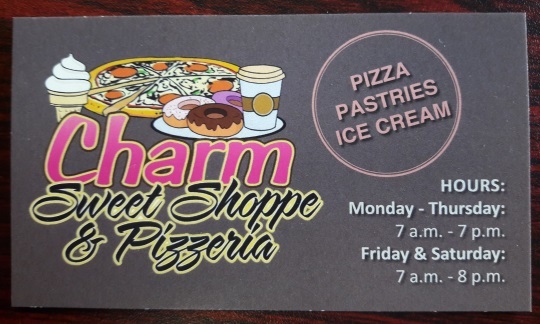 I do plan on visiting the Charm Sweet Shoppe & Pizzeria next time I’m in Charm. 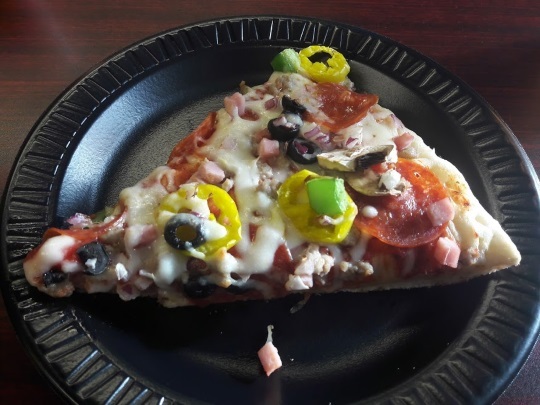 Neat – Whitmers noted, as is the pesto pizza in Charm. I’ll ask about that one next time. Thanks for the insider tips Yoder 🙂 I do like Charm as well. Berlin, Walnut Creek, and Sugarcreek have the tourist atmosphere, but towns like Charm, Mt. Hope, and New Bedford do have more of a “real” Amish country feel. There’s another New Bedford?! What state? The one in MA was the “ City that lit the World “ (with whale oil). Lots of history here. Also, I love reading this site, I grew up in the country and miss it. If you ever make it up here visit the Whaling Museum. Last night when I read this I remembered you mentioned being at the beach on vacation and then saw New Bedford and Mt. Hope. I though maybe you were in New England. There’s a Mt. Hope over in Rhode Island and I’m in New Bedford, MA. It’s common to see people at the beach in the winter; but no Amish around here. There is a Quaker history here and Meeting Houses that are still active. Glad you had a great vacation and thanks for this site! This is actually all in the Holmes County, Ohio area. Mt. 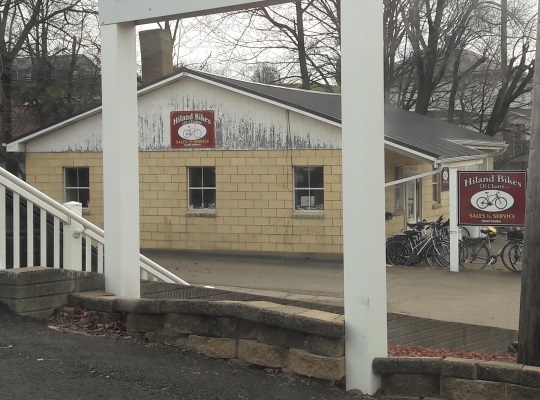 Hope is a little village which is home to an auction house, post office, and other businesses heavily frequented by Amish. New Bedford is another little town in an Amish area of Coshocton County just south of the Holmes County line. Both are interesting places to visit if you want to know how Amish live in that community. We live on the coast of N.C. and make the trip to this area each year. We especially enjoy the spring and fall. We try to see a play while there and do some Christmas shopping. Keep up the excellent reporting! Are there any places like this that you are aware of in Southwest Iowa, or in the Omaha, NE area? 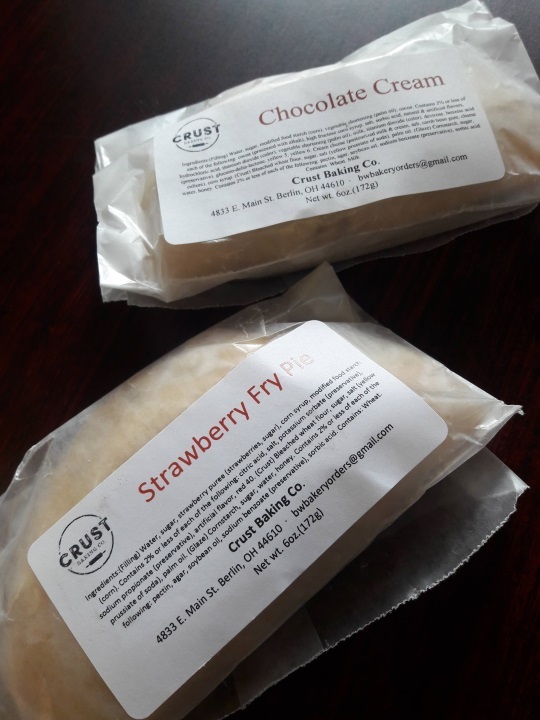 I’d love a good fried pie recipe as well! Do you have a link to an Amish recipe site, please?